Super Dynamic Full HD Dome Network Camera. 1080p Full HD / 720p HD images up to 60 fps . Super high resolution at Full HD/1,920 x 1,080 created by high sensitivity MOS Sensor. Approximate 1/3 inches, high sensitivity MOS image sensor. High sensitivity with Day & Night (IR) function: 0.01 lx (Color), 0.003 lx (B/W) at F1.3. • Multiple H.264 (High profile) streams (max. 4 streams) and JPEG streams ensure simultaneous real time monitoring and high resolution recording . Auto VIQS (Variable Image Quality on Specified area) function recognizes the no movement area in a video automatically and lowering the resolution of it to reduce the data size. FDF (Frequency Divided Filter), the network bandwidth and the disk space of recorder can be saved. • Cropping function enables to provide whole image and the part image simultaneously. Up to 4 image capture areas can be specified, and it is also possible to control the sequence. • Lens distortion compensation for the distorted images can be adjusted 256 steps. • Alarm sources including 3 terminal input, VMD and Panasonic alarm command can trigger actions such as SDXC/SDHC/SD memory recording, FTP image transfer, E-mail notification, Indication on browser, Alarm terminal output, and Panasonic alarm protocol output. • Can be added new intelligent extension software(Optional) in addition to built-in VMD (Video Motion Detection), alarm function. 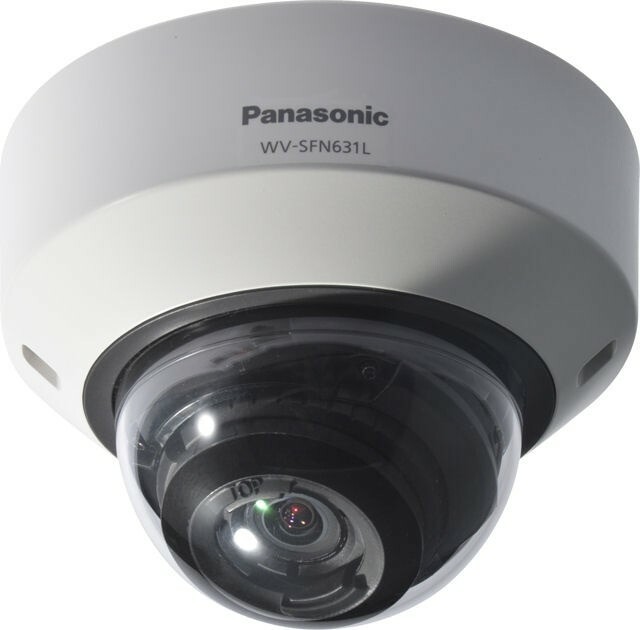 The WV-SFN631L 6-series fastened Dome Network Cameras, for indoor usage, supports Full HD 1080p at 60fps. Equipped with the new powerful Panasonic UniPhier® System LSI with increased codec engine, new MOS image detector with Multi-processing Noise Reduction (MNR) and Intelligent Resolution Technology, the WV_SFN631L has improved image quality with 133dB wide increased Super Dynamic, high sensitivity in low lightweight conditions, IP-network friendliness and also the easy installation and use. The fastened Dome Network Camera is additionally equipped with a large vary intrinsic IR semiconductor diode for getting clear pictures within the dark, further as twin South Dakota memory card slots for storing recordings regionally. Display Mode Spot, Quad : Image from 16 cameras can be displayed in 4 different Quad screens or 16 split screen (JPEG only). 20 characters camera title available. Notes *1 Converted value *2 Super Dynamic function is automatically set off on 60fps mode.